More than 50 years ago, Bernard F. “Bernie” DeCastro started on a path that led from his home in a low-income suburb of South Miami into a life of addiction, crime and incarceration. Bernie’s life of crime began with an 11 month stint in the infamous Marianna Reform School for Boys in 1959 and ended in 1976 when he was adjudicated a hardened habitual career-criminal and received a life plus 30-year prison sentence for armed robbery. 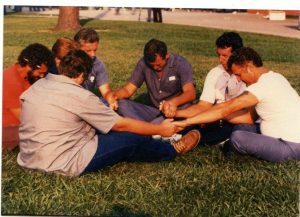 While serving that sentence Bernie had a spiritual epiphany when he fell on his knees in that prison cell (Aug. 9th, 1981) and surrendered his broken down life to to Jesus Christ. DeCastro was paroled in 1984 and moved to Ocala, Florida to start a new life. Ten years later (1994) Bernie petitioned Governor Lawton Chiles and the Florida Cabinet for executive clemency; the Governor and Cabinet was so impressed with the radical change in Bernie’s life that they granted him a full and unconditional pardon. In 1987, Bernie DeCastro founded Time for Freedom, Inc., (TFF) a faith-based, Florida non-profit 501 (c)(3) organization to preach and teach the gospel of Jesus Christ to prisoners and to provide transitional reentry services to ex-offenders. Today, Bernie is a single dad of 5 children from 18 to 28. He is the CEO of the Reentry Center of Ocala, a private 100-bed work release center for men who are transitioning from prison back into society. The prisoner has now become the Warden, so to speak. God is good! Since his parole from prison in 1984, Bernie has dedicated his life to keeping Florida’s citizens safe by helping inmates and ex-inmates live productive law-abiding lives. 2002 Appointed to represent Florida’s faith-community on Statewide Drug-Policy Advisory Council – Gov. Jeb Bush. 2001 Appointed to represent Florida’s 6th District at the National Faith-Based Summit, Washington D.C. – Cong. Cliff Stearns. 2014 Became first and only convicted felon in Florida to run for Sheriff (of Marion County). DeCastro garnered almost 30% of the vote. 2010 Became the first and only convicted felon in Florida to run for U.S. Senate. 2006 Became the first and only convicted felon in Florida to run for Governor. 2005 Opened a 100-bed private work release center under contract with the Florida Department of Corrections to help men transitioning from prison back to the community. 2003 Published the Florida Faith Based Association’s Substance Abuse and other Faith Based Human Services Directory. 2002 collaborated with the office of the Governor to host the first Statewide Faith Based Conference. 2001 Opened 20-bed residential transitional aftercare center for men released from prison. 1999 Planned, organized and hosted statewide Restorative Justice Ministry Network conference. 1998 Planned, organized and hosted statewide Restorative Justice Ministry Network conference. 1998 Founded Restorative Justice Ministry Network of Florida. 1998 Co-Founded Restorative Justice Ministry Network of North America. 1996 Developed, directed & produced ministry video, The Manhood Series made possible with a $25,000.00 grant from Promise Keepers. 1995 Developed, directed & produced ministry video, Hope For The Hopeless for those being released from prison back to the community. 1994 Ordained as a minister of the gospel of Jesus Christ by Grace Christian Fellowship. 1991 Developed, directed & produced Award-winning drug prevention video entitled Decisions©. McGraw Hill Publishers signed a contract with us to distribute the video all over America. 1989 Developed, directed & produced The Trauma of Transition, a four-part video series to help inmates being released from prison understand the issues of transitioning from prison to society. 1987 Founded Time for Freedom, Inc. and serves as CEO. 1986 Elected to the National Board of Directors, Kairos International Prison Ministry.